Crafters and Scrapbookers!! 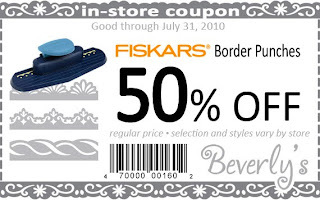 Through July 31st, get 50% off Fiskars Border Punches when you bring this coupon with you on your next visit to your local Beverly's store. You can check out a complete listing of Fiskars Border Punches on fiskars.com. Our selection will vary by store, so call or visit to see what we have on our shelves. See you soon!